The purpose of ventilation is to freshen up the air inside buildings in order to achieve and maintain good air quality and thermal comfort. Ventilation also has important psychological aspects, which can be illustrated by the feeling of being in control, having odour management and creating a link to nature. • Comfort: the pleasantness of the air is immediately felt when a person enters a building. • Health: breathing poor indoor air can have negative health effects. • Performance: high-quality indoor air can improve mental performance and general well-being. • Other: fresh air creates a link to the outdoor environment, and fresh air through windows is a valued aspect of ventilation. • Gases; e.g. formaldehyde, organic chemicals (VOC) and inorganic chemicals (NOX, SOX, etc.). • Particles; e.g. house dust and combustion products. • Human beings and their activities; e.g. tobacco smoke, products for cleaning and personal care, consumer electronics and electrical office equipment like laser printers. • Building materials; e.g. thermal insulation, plywood, paint, furniture and floor/wall coverings. ​Figure 2.1.1 The main reasons for ventilation. Indoor air is affected by other means than the indoor generation of pollutants – outdoor air also has an influence on indoor air quality. Particles are either directly emitted into the air (primary) or formed in the atmosphere from gaseous precursors such as sulfur dioxide (SO2), ammonia (NH3) etc. (secondary) (WHO, 2013). Primary particles are emitted by e.g. combustion engines (diesel and petrol) - they are spread to the outside air and may eventually penetrate into buildings, thereby effecting the indoor climate. Ambient or outdoor air quality has been shown to be improving - pollution levels in cities have fallen in recent decades due to regulation of industrial pollution and less polluting vehicles. Particles are differentiated in size (ultra-fine, fine and coarse) and the size determines how they spread within buildings and outside buildings. Particle size and their chemical composition are important factors for their health impact. Fine and coarse particles are measured by their weight in μg per m3 while ultra-fine particles are measured in particle count (number) per cm3. Fine particles (also called PM2.5) can travel for thousands of kilometres across borders, while coarse particles (also called PM10) are spread over only shorter distances up to 100 km (Schmidt, 2003). Ultra-fine particles are mostly generated from diesel cars and are concentrated locally, spreading over only short distances and decreasing with height above street level. There are limited studies in literature on the difference in particle levels between rural, urban background and urban street settings. For example, measurements from Denmark in 2012 show that urban background levels of fine particles (PM2.5) are 10% higher and urban street levels 40% higher than those in rural backgrounds (Ellermann et al., 2014). Other sources of pollution of indoor air should be included, along with ways of controlling them. Dampness in buildings is associated with an increased risk of adverse respiratory conditions including asthma and allergy. Living in a damp home increases the risk of having asthma by more than 50% (Grün and Urlaub, 2016). On average, 16% of Europeans live in damp buildings (Hermelink and john, 2017). It is important to ensure that relative humidity indoors is kept at reasonable levels so as to limit the risk of mould and condensation in the construction. Showering, cooking or an evening with guests raises humidity in the home, which needs to be removed by ventilation, ideally at source (e.g. cooking hood). Ventilation is an important means of achieving good indoor air quality in buildings, as it removes or dilutes pollution and moisture. As newer buildings have become more airtight and well insulated, there is an increased focus on the ventilation system, either natural or mechanical, to ensure good indoor air quality. 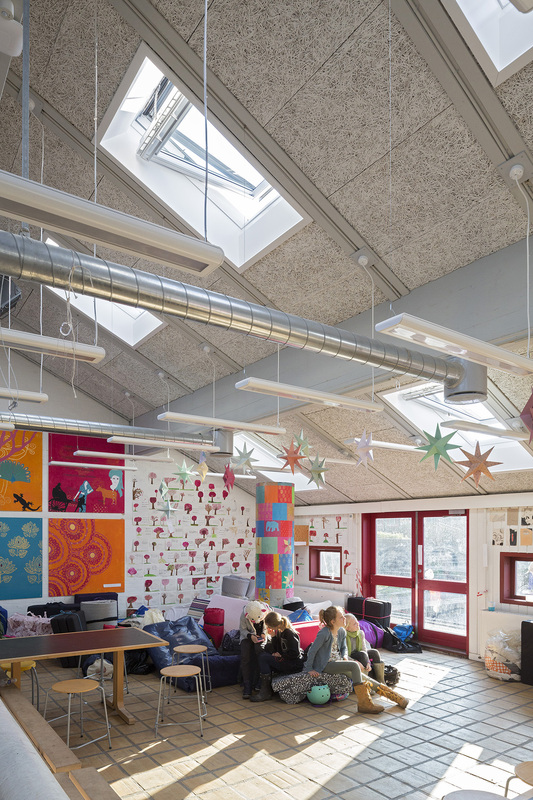 Ventilation is a compromise between energy consumption, health and costs. Excessive ventilation will increase energy use in cold climates and cause draughts, while insufficient ventilation will cause bad indoor air quality and possible health problems. Airing with windows, using timers or sensors, in the morning, afternoon and before bedtime will help create good indoor air quality in the house. As described earlier, indoor air contains many pollutants. For many years, discussion has continued as to which indicator for indoor air quality is the most suitable. Carbon dioxide (CO2) is probably the most commonly used indicator, measuring the CO2 produced by human breathing and emitted by appliances such as gas cookers and boilers (CIBSE, 2011). Other indicators are humidity and volatile organic compounds (VOCs), both of which are possible indoor air quality indicators. CO2 is a good indicator of the indoor air quality in houses, where the occupants and their activities are the main source of pollution. Outdoor air contains approximately 400 ppm; breathing generates CO2, so the indoor CO2 concentration will always be at least 400 ppm and usually higher. An indoor CO2 level of 1 150 ppm provides adequate air quality, 1 400 ppm will ensure good indoor air quality in most situations, and 1 600 ppm indicates poor air quality (CEN, 2007; Active house Alliance, 2013). CO2 is most relevant as an indicator in rooms where the need for ventilation is linked to the presence of people, e.g. in bedrooms, children’s rooms, living rooms, dining rooms, classrooms and offices. The relative humidity indoors will vary on a yearly basis in correspondence with the humidity level outdoors. A high level of humidity in indoor air can increase the presence of house dust mites. So in climates with cold winters, the relative humidity inside should be kept below 45% during winter (Richardson et al, 2005). Generally speaking, high relative humidity levels should be avoided in order to limit the risk of mould growth, with negative health conditions such as asthma and allergies as a consequence (Liddament, 1996). As humidity is considered to be the main pollutant in homes, it can be relevant to keep the indoor humidity level under observation. For some rooms, this can be done via the relative humidity but, in more advanced systems, the difference in humidity content between the indoor and outdoor air can be evaluated and used as an indicator. Measuring relative humidity has been done for many years and is now a market standard. The indoor levels are generally high during summer and lower during winter. With the same ventilation rate during summer and winter, the indoor relative humidity will be very different from summer to winter. In other words, a fixed relative humidity as indicator for Indoor Air Quality has, some limitations and is most useful in wetrooms, where the objective is to avoid very high levels of humidity. Relative humidity is very relevant as indicator in bathrooms, and in kitchens. In terms of absolute humidity, however, the difference between indoor and outdoor humidity content may be the best indicator, even though this will require indoor and outdoor sensors. In this case, a difference of 3.5 g of water vapour per m³ of air is a reasonable level, and may be used all year to check if the humidity production in the home is balanced correctly with the ventilation rate. Measuring the difference in absolute humidity is not a market standard,so there are few products on the market. Volatile Organic Compounds (VOCs) are substances that evaporate easily and are a mixture of many different chemicals such as benzene, formaldehyde and trichloroethylene (TCE). The effect on humans ranges from experiencing upleasant smells to severe health effects, e.g. as a cause of cancer. There are two kinds of VOC sensors on the market: one that measures the actual VOCs in the air, registering odours, cooking and smoking fumes, and solvents; and one that correlates VOC levels with CO2 levels coming from human activity which also generates VOCs. This fact, combined with the ability to detect smells, could make VOC sensors an alternative indicator for air quality to CO2 as the VOC sensor is often cheaper in price. It is generally difficult to quantify the limit levels of VOCs, which is more commonly often used in scientific circles; whereas VOC sensors correlating with CO2 levels could be a good alternative to existing CO2 sensors that evaluate human occupancy in buildings. Active House Alliance (2013) Active House – the specifications. Bornehag, C. G., Blomquist, G., Gyntelborg, B., Nielsen, A., Pershagen, G. and Sundell, J. (2001) Dampness in Buildings and Health between Exposure to ‘ Dampness ’ in Buildings and Health Effects (NORDDAMP) Indoor Air, 11, 72–86. Nazaroff, W. W. (2013) Four principles for achieving good indoor air quality. Indoor Air, 23(5), 353–6. Schmidt, L. (2003) Ultrafine partikler. Gasteknisk center. Sundell, J. (2004a) On the history of indoor air quality and health, Indoor Air, vol. 14, no. 7, pp. 51-58.
WHO (2000) The right to healthy indoor air.